Discussion in 'Indivisible' started by Kasumi, Dec 15, 2015. 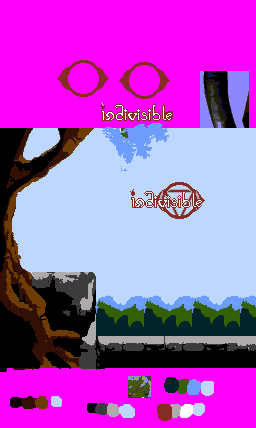 I demade the Indivisible Prototype by Lab Zero Games on NES. 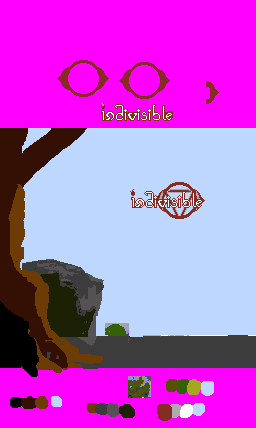 It contains the movement things from Indivisible and not much else. It was made in a week more or less. Seriously, the .gif contains 100% of the content of the ROM. I guess you could call it "Interactive Fan Art", rather than a game. Grab it at the bottom of the post. (For Mods: This isn't a hack or anything illegal, despite being a ROM. It's 100% original code.) It doesn't do anything fancy, so it should work in whatever emulator. But if you don't have one lying around, I recommend FCEUX. Edit: Well, there's no longer a version in at the bottom of the post. RIP original Indivisible NES, 260 downloads. Left/Right = Move. Double tap to dash. I probably won't work on it more. What follows is information about its development that may be interesting. Ever since the April Fool's Skullgals mockups were released, I wanted to try to make that somehow. But what I know best is NES, and it would not have been very fun to do there. (Insert technical reasons here.) I did some graphics for it before deciding it'd be too time consuming. I'd considered just learning to program for Neo Geo to see if it was easier or even possible there, but nothing specific ever pushed me from, "Cool idea" to "I'm making this." 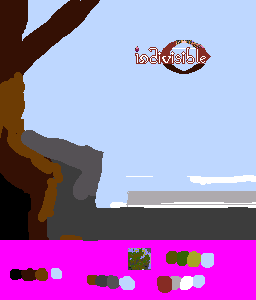 Then the Indivisible Prototype came out, and I decided I want to demake that for NES. I started to make some graphics for it. NES hardware sprites are 8x8 pixels. There are four palettes containing three solid colors and transparency. 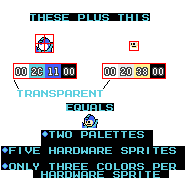 Each hardware sprite can use the three colors from one of those palettes. This technique is called sprite overlaying. There's one additional restriction to keep in mind. There can only be 64 hardware sprites on screen at one time. Here are some graphics I made way back in August. I was trying to minimize sprite count for the very early versions. I was worried about the sprite overlays using many more hardware sprites than I generally expect. Later, I still tried to keep the sprite small, but focused quite a lot on keeping her scowl. The two dot for eyes thing didn't give me the right feel, but none of these really look like Ajna either. At this point, I quit. "Cool idea", but not, "I'm making this." Then I learned Mike Z was going to NEC. I've gone to the last two NECs. They're mad close to me and fun. I thought it'd be cool to show him in person if I got a chance, and if not... I'd post it on Skullheart like I'm doing now and still have fun at NEC. (I did end up getting the chance, and it was pretty cool! I might write more on that elsewhere.) This gave me a deadline, and a reason to do it. This was probably very early October. There was something really hard I had to finish on another project, and then this would be a really cool quick thing while I took a break from that first project. The one of the left has academic appeal. It's 16x32 pixels (excluding the stuck out hair), the same size as big Mario in Super Mario Bros. I decided I could spare the extra two sprites for the better proportions on the right. However I still wasn't done with the really hard thing on the other project, so this went on hold again. I finish the hard thing. It's December 5th. NEC's like a week away. The only thing I have done is a single idle frame. I sent an action plan to someone I talked with about this. 1. All general movement animation. Running, wall jump, axe swing, airborne axe swing. 2. Maybe non essential movement animation. Crouching, punching the air, airborne punching the air. 3. Break up metasprites into sprites and arrange them into CHR. 4. Animate the character in game. 5. Remake the title screen scene. 6. Make tileset for the temple. 7. Make that collision enabled and scroll-enabled. 8. Enemy Animation. At least... one of 'em. Writing all that out, yeah I'm not getting as far as I want. But the steps are laid out so that there's something cool no matter when I stop. I only need to get to step 5 for it to be cool. Step 7 is gravy. Assuming each step takes a day, I'm in there for the title screen. Keeping in mind the goal was to have something to show, I animated everything first. In the worst case that that took the entire week, it would still count as cool fan art. The only "non essential" animation I did was standing axe swing. It contributed nothing "real" to what I thought I could get done, since there's nothing to chop. Jumping axe swing was essential since it's used for hanging and climbing. I did it so that pressing B while standing would do something, given that pressing B in the air does. Someone who saw this at NEC asked me why I didn't do crouching (and the awesome crouch dance). It would have added a crouch frame, plus a crouching axe swing to the list of things to animate. This may seem easily automated, but things like sprite overlays and frames being offset makes the naive approach not work. If I start at the top left and grab 8x8 blocks, different head sprites would be created for the hair-stuck-up and hair-stuck-down running frames. The pixel of higher hair would push the rest of the head down, so all hardware sprites in those hair-stuck-up frames would be offset one pixel from the hair-stuck-down frames. This would mean they're different, and couldn't be merged. The above contains a couple of duplicate sprites. But NES Screen Tool can easily remove duplicates once things are broken down into 8x8 hardware sprites. I also totally missed a required tile somehow, so I had to add it later. (Downsides of doing it manually.) This took a fair amount of time, since everything else is not as easy as the heads which were designed to be repeated. This is something that would have been easier to automate, but again, I wasn't sure I'd have the time. So I did it manually. NES hardware sprites can be flipped horizontally and vertically. So at the end you can see I used a sprite normally used for her hair to get just one extra pixel for her footwear. So I took a look at the source code of NES Screen Tool and found that it saved this data in blocks of fixed sizes for each frame. No compression or anything. So I wrote a program to read the saved files rather than the exported ones (while offsetting everything so there was never a negative offset which makes something else a little harder), and got my own output that I feed to the assembler. Early in the morning on December 10th, I wrote my first code for the actual ROM. I began with some defines for how to create and manage objects, using rules I developed for another project. Within a few hours I had a rom that initializes the console, loads the palettes, and displays a single frame of my choosing from the NES Screen Tool data. At this point, I needed to begin to make Ajna move and be animated in game. I cheated with acceleration and friction. Some things that are easy to do in C are hard to do in 6502. Like... if you're holding left, but you're moving right, apply deceleration. If you're holding nothing, apply friction. If you're holding left and moving left apply acceleration. Deceleration is usually higher than acceleration and friction, so you can stop on a dime, but don't accelerate too fast to control. It's a problem I have solved in something else, but the code is a mess... and this being time sensitive, I took the easiest route. Friction, acceleration and deceleration are the same. Checking for max speeds is another somewhat tough problem in 6502 assembly but this was actually necessary to the feeling of the game. (It's tough because Indivisible allows you to travel above the "max speed" in a lot of conditions, as well as having a variable "max speed".) I soldiered through it. By the end of December 10th I had a fair portion of the movement done for the game. NEC technically starts December 11th. I usually don't go the first day anyway, so I decided to take that extra day and go to bed. I had not yet put in the standing axe motion (again, I focused on essential things first), and she can't dash. There's also some hard-to-see frame offset issues. She's otherwise complete. One of the things I'm proud of is implementing a subroutine (function) for collision detection despite there not really being anything to check. Essentially it's "if point is outside screen, return collided, else return notcollided." This is what allows the Axe Climb to work in the above .gif, but it was also something I could easily hijack later when actual collision information was added to the rom. Yay foresight. I'm zeroing in on at least getting the title screen done as planned. 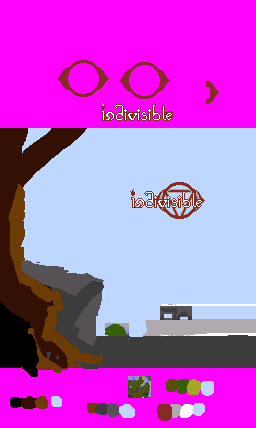 For Friday what's left is basically adding small things and drawing the Title Screen. NES can use 256 unique background tiles to draw a background. (Without some tricks that I wouldn't have time to implement.) A background tile is 8x8, just like a hardware sprite. Also like sprites, the background has four palettes of three colors + transparent. The background is drawn with a solid color of your choosing, and then the tiles are drawn on top of that solid color. So in a way, it's like you have four palettes of four colors, but one color must be the same in every palette. However unlike sprites, the background tiles can only use one palette for every FOUR tiles (laid out in a 2x2 square.) There's an exception to that, but let's not talk about it. At this point I've got an 16x16 grid on so I can make sure only one palette is used per 2x2 tiles. I'm still trying to keep it organic and not blocky, though. I made the palette for the starting rocks contain the bright tree color so the tree could slightly "run into" the rocks without breaking any rules. At the point, time began breathing down my neck, so I started cheating and painting over actual textures from the game. (I'm so sorry... ;_;.) 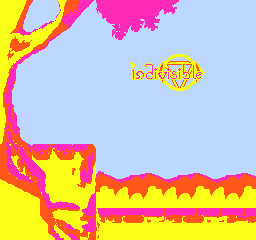 The palettes in this image are actually not possible on NES. There's not a color that appears in all four palettes. I abandoned the idea of having a palette specifically for shrubbery, and instead decided to have some fake layers of faraway background. The darker blue in the palette also allowed me to have faded looking leaves for the big tree in the background. I'm happy enough with this image to see what the actual damage is tile wise. I wasn't entirely happy with the background, but I was out of time and still had to add collision info and dashing and other things to the actual ROM. I never bothered to check the ground beneath her while standing. At 4:19 AM the day I was going to show this, I fixed that. But I had to get sleep to not be a zombie for NEC. I made sure it worked on the actual console (which I had not done since the started the project >_>), and thankfully it ran without problems. I packed up my NES and went to bed. And that is how I made a tiny Indivisible prototype on NES in about a week. Thanks for reading all that! The version uploaded in the post is a little updated from the one shown at NEC. I fixed the animation bug (she just runs against the walls instead of switching to idle all the time), and cleaned up the background a little. Edit: Well, there's no longer a version in at the bottom of the post. RIP original Indivisible NES, 260 downloads. Almûrníssôn, Kongk4, Rakurin and 51 others like this. Saw this at NEC, hella awesome. Thanks for sharing all the behind the scenes details, I love reading this kind of stuff. 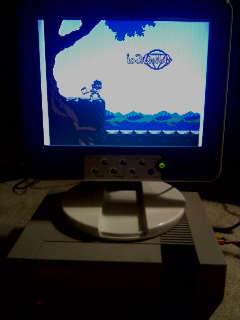 But yeah, great job on this, and for sharing your process while getting it to work on an NES. I guess it's way too soon to think about a full Indivisible retro spinoff, but it'd definitely be cute to see Ajna go on some old school mini adventures like this. I'd certainly rather play that than the Indivisible First-Person Shooter (Call of Iddhi)! North888, BallotBoxer, The Dave and 2 others like this. Thanks all! This was a pretty fun project, and taught me how stressful a game jam might be. 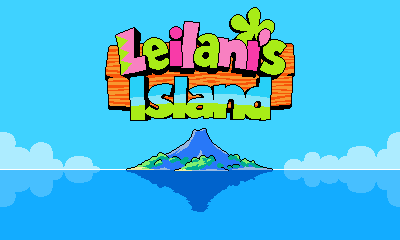 I can't wait until Leilani's Island comes out for real. I've been following it for a while. gluemchen, BallotBoxer and KaboomKid like this. I'm amazed at how close this FEELS like Indivisible, in terms of speed and angles of jumps. That's insane! Real cool stuff, man. Speaking of devlogs, have you posted about this fan project on any other sites? If you ever decide to continue working on it, that might be a cool way to keep spreading awareness about the game. I just found this out today and this looks fantastic. I especially like how you showed how you made the sprites for Ajna in your first post. Your creation for the NES version of Indivisible is well done! I never been this proud since the campaign is a success! This is very interesting, actually. I'm not sure if you mentioned it in the OP somewhere, but I was wondering if you have any more plans for continuing this to some degree, or adding enemies? What's there is great, though. For 3 months of work, they put a lot of effort into physics and sprite work. The frames on Anja are surprisingly fluid, especially for NES. @Goodbye18000 ;) I see you! @KaboomKid: I hadn't really planned to post it anywhere else. The cool part for people who know nothing about Indivisible it that it's on NES, but there's only about 30 seconds worth of things to do. If there were more, other communities might find it more interesting, I think. @Meow-Professor: It does say in the post that I probably wouldn't work on it more, but I'm starting to rethink that. @Mc.Rad: 3 months of work in the actual prototype or this? All the animation/everything for this was only a week of work, except for one frame. (Standing idle was finished in November.) I had planned to do it for longer, but life got in the way. Thanks for the kind words, everyone else. My original plan was to at least have a temple to platform in, but once the surprise happened a big part of the drive to work on this went away. However, the reception to this has been pretty amazing, so I think I may try to fulfill that plan. I don't promise this, so definitely don't expect I will remake every aspect of the prototype. But know NES can basically handle all the game logic. The main issue would actually be getting 4 incarnations and enemies on screen at the same time with the 64 hardware sprite limit. But it is all... real work, and this was partially made only as a break from something else I'm working on. gluemchen, North888, Goodbye18000 and 3 others like this. So I am updating this, but there's a lot of other things I've had to do which is making progress slower than I hoped. I wanted it to be done like last week. It's mainly asset creation left now, but I'll not post any more info than that. I want the progress to be a surprise on release I guess. Goodbye18000, Gamrdogg, SkullMan and 3 others like this. In theory, I'm a programmer and an artist. But I guess the art part is slow. The first making of post goes into it a bit, but getting graphics into an NES game isn't so easy when they're not just drawn in a rectangle. I wish, wish, wish I could just paste these frames in without having to break them into 8x8 sections, but that's not how it is. There's also a hard limit of 256 8x8 sections at once, which all of Ajna's animations alone will probably exceed. Extra stuff has to be done to overcome that. But that's a coding thing, and will actually be super easy. Currently, I'm just animating things. It's taking all of my willpower not to post something cooler. Edit: Upload crouch+uncrouch for a better loop. Previously it was just crouch. gluemchen, Goodbye18000, North888 and 4 others like this. But can she do the leftrightleftright crouch dance? This is the most important part. Sure that's great, but will she punch bats? missingno: Are you sure you want such vital information spoiled? SkullMan, CatfishZealot, gluemchen and 4 others like this. Eh, one more sneak peek. Maybe this one gives away too much, I dunno. I'll say it's still not the cool thing I want to post. Reached a pretty big milestone, so hopefully not too much longer before this is out. jam1220, KaboomKid and Broseidon Rex like this. I'm running out of reasons to keep this thing's development private. This animation is actually pretty subject to change. I haven't checked if it's a reasonable number of sprites yet. The sprite limit has been hitting me very, very hard for this project. I could make a thing, but if it uses too many sprites, I have to remake it smaller or make it use fewer colors, or tetris together its pieces differently. I basically deeply underestimated the amount of time art would take on this. (And also, my standards got higher as time went on.) All of the code has been maybe... 4 days? Remaining code work will probably take about as much time as the initial release's code which I basically put together in 2 days. All other time spent is art, art, art. The end is in sight, there's only one remaining thing I'm worried about. I will say one thing now so whoever might be following this doesn't get their hopes too up. I am actually not doing the battle system. I'll go into more detail about why whenever this drops, but short version is I've already spent a hefty amount on this and the battle system requires some tough things still. Still, I'm quite sure everyone will be pleased. jam1220, SkullMan, Meow-Professor and 6 others like this. I am actually not doing the battle system. Good! Not that I doubted your skills or anything, but you were already putting in more work than I'm sure a lot of us expected, so it's great that you're not letting yourself get too overwhelmed. It's looking great so far, and I think a nice simple fangame will be more than enough for everyone to enjoy. I can't wait to check it out! Best of luck wrapping it up, and thanks for sharing with us! Yeah man, getting the Indivisible battle system on NES would be super tough. No reason to be THAT accurate. I mean, to compare, the "NES Version" of Azure Striker Gunvolt and Mighty No 9 don't have either of their "battle systems". Thanks for the support. I've actually written the "Why I didn't" thing, but waiting to post it. To be honest, the making of post for the finished thing is looking kind of daunting to write, so at least that part's done. (Much less likely this one'll change, but also unchecked.) Okay, but now probably no more updates for a while because I'm running out of things that don't really ruin this. Edit: Actually may as well give what is close to an actual update instead of a tease since the scope thing isn't... very secret anymore. I have 25 remaining things on the "outside of my usual realm" todo list. Maybe 12 non small things on the "comfort zone" todo list. One thing I may release without honestly... depends on my mood on the particular day I try it. I can see that end, but it's not quite close yet. Slowly spoiling the whole thing. Who wants to see what an animation looks like before I butcher it to make it fit within sprite/tile limitations? Provided there are not any hard animations left (this was a hard one), maybe this'll be out in #twoweeks. Also depends on that thing I'm considering releasing without. jam1220, SkullMan, CatfishZealot and 7 others like this. hey man, your animation is legit. You want any help with some spriting? I dont know if I could help myself, cause I'm busy, but still, anything to keep this going. Late response: First rest assured that there's no way this won't keep going/won't be released. (Unless err... something happens to me.) I definitely wish it was already finished >_>, but I'm not just gonna stop with as much as I have. I don't want help with sprites specifically because it's just too much work to request of people. It's not just drawing the frames, there's a lot of dumb NES stuff you have to be intimately familiar with. I've had a couple of pixelation members offer help on backgrounds. You can see some general pixelation work here in the NES Castlevania "remix" thread to get an idea of pixelation quality, but I won't point out specific people who have offered. Music was maybe slightly a secret, but really all the secrets are out at this point. To help with music, you've gotta be decent at Famitracker (2A03 since this game doesn't use hardware that allows for extra sound channels) as well as being able to additionally limit yourself to Famitone2 restrictions. It doesn't matter if the NES can do it if the music engine can't. A lot of general Famitracker stuff you see couldn't really appear in a game because it'd be too huge, or too CPU intensive, or too something else. I do have a person in mind for music if I fail spectularly in my attempts, but if anyone thinks they can do it let me know. Same for backgrounds. Realize all followups on this project are basically waiting on all animation being complete (and in the game), though. With all animation complete, the project stops being hard. Hopefully that's not too offputting a response, I do appreciate the concern/offer. KaboomKid and Goodbye18000 like this. All animation is done. (But not in the game. )* Getting it in the game is easier thanks to some tools I wrote, but still time consuming. 43ish animations total. I suppose that's a number like lines of code, though. It doesn't actually mean anything. Ajna actually doesn't have her idle animation. Maybe that'll change like minutes before release. All these animations are subject to change to make them fit snugly together. *Does not mean all graphics are done. Excludes effects animation. Excludes the inevitable revisions to get them to fit in the game. Side effects are generally mild. Ask your doctor before trying Indivisible animation. jam1220, SkullMan, Broseidon Rex and 9 others like this. Roti's idle is so perfect. This all looks really great so far. Thanks, Meow-Professor. I actually... regret how much time I spent on the Roti idle, but also really like how it came out. There are a few completely unimportant animations that ended up being a lot of trouble.There is certainly some stuff I plan to write about the animation at length when this is all over. Figured I'd give more of a devlog like update this time, since I care less and less about the development being secret. I have four specific things I'd rather not show still. Anyway... NES can have 256 unique 8x8 sprite tiles in memory at once. In the initial demo, Ajna's animations (which... were the only thing that used sprites) used 180 unique 8x8 sprite tiles. That's... a lot. But it didn't matter because there was nothing else. I put all 180 in memory at the same time, and there was still room for 76 more. All of her animations together currently use more than 256 unique 8x8 sprite tiles. (Perhaps around triple? Maybe more? I'd have to update a program to get an exact count.) But the limit isn't unique tiles. It's tiles in memory. You only need the tiles for the animation frame you want to display for the current game frame in memory. Anyway, due to the nature of Indivisible for NES' current hardware setup, I can only swap in and out of memory four 64 tile blocks. I wrote a tool that automatically takes Ajna's animation definitions and splits them into 64 sprite tile blocks, duplicating tiles across blocks as necessary. This tool might choose to pair her run frames together in a block since they all share sprites for her "side-facing" face for example. But if it needed to add a frame that needed say... 12 new sprite tiles in addition to the shared ones, and the block already had 60 sprite tiles in it, it would place those 12 new sprite tiles in a new block as well as duplicate the shared ones from the block it first attempted to the new block. This is part of why I don't know how many unique sprites her animations have. I only know how many blocks, which contain duplicates. So, one of the four 64 tile blocks is reserved for Ajna. The game just loads the block that contains the sprite tiles for whatever frame she's currently displaying. (Other frames will be in the block too, and that's fine.) This leaves 192 for whatever else needs to be in that frame. But... there are some subtle disadvantages to this behavior. Say I wanted this game to be two player. Imagine if both Ajnas needed to display frames in different blocks! I could just reserve a block per player, but then there are only 128 left for everything else. In the original demo, I could also totally have two Ajnas, because all her sprite tiles were in memory at the same time. But in that case, only 76 were left for everything else. We're now done with the preinformation and getting to the meat. I do not have room in the 192 tiles not reserved for Ajna to do some of the things I kind of wanted to. I haven't checked for duplicates yet, but the Hungry Ghost's breakdown is over 64 unique tiles. I have not yet broke the Ahp down, but I expect it will use even more. And Belu... I've always known that probably just three frames of Belu will use more than 64 unique tiles. similar to the problem of having two Ajnas... I can't have two hungry ghosts if they want to display different frames. Or two Ahps. Or two Belus. At least not for free. My original plan was to have just one Belu on screen at once with a reserved block like Ajna's. This left 128 tiles for all of the Ahp and Hungry Ghost frames. This seemed reasonable: As I stated before, Ajna in the original demo used 180 tiles. I thought I could squeak under 128 with the Ahp and Hungry Ghost that have fewer unique frames, fewer overlays, and are smaller. But unless I really luck out with the Ahp breakdown, I'm a bit up a creek with that plan. 5. Instead of dedicating blocks to a type of object, dedicate them to in game entities. So I could have Ajna, Hungry Ghost, Hungry Ghost, Hungry Ghost or Ajna, Ahp, Ahp, Hungry Ghost, or Ajna, Hungry Ghost, Ahp, Belu. You get the picture. No more than three enemies on screen, but they could be any three. This is also pretty easy to do. 8. Some combination of the above. 9. Realize the Ahp uses very few unique sprite tiles, and regret writing this post. A broken down Hungry Ghost Idle. It looked like it was going to fit under... then... well let's just say the other frames use more than tiles these four. Hopefully this was interesting. If not, well... I got something out of it, anyway. Mike_Z, Luweewu, SkullMan and 6 others like this. yeah, if you'll have me, I want in. I was trying to wait to have a real update to post, but... ain't got one, probably won't for a couple of days. So @A Red Mage as stated I do have a person in mind, and may still attempt it myself. I wish progress was faster and I knew how these cards would fall... Music will be the last thing I worry about. But nothing to stop you from trying. Apparently you can use musetracker too, but I don't have a thing to test music set up for that if it's different. Which should mostly make sense if you're familiar with Famitracker, or even just some other tracker. Even if not, the NES rom tool will complain if you use something not supported. So use it to check your work. I'm obviously looking for covers of music in actual Indivisible, but whatever is made can be super note heavy or super advanced or whatever so long as it fits within the above restrictions. The resulting output also has to be less than something like... maybe 14KB? But if you hit that, something is very wrong. When I did a small test attempt at music, I found that Lost Genesis ripped from the game is 1:31, but is basically looped at 46 seconds with more percussion. Next update should be some enemies moving around, but there's some stuff I need to figure out with how to interact with them. How hits work is 100% not final. Full disclosure: The engine doesn't yet have anything to compensate for more than 8 sprites per scanline, so for the above gif (and below png) an emulator option has been turned on that draws all sprites. (If you don't know what that means, you may have to wait for the next making of. Explaining it is how the other post got long.) As well, the Hungry Ghosts don't actually have any AI. They hop left and right purely because I'm pressing debug keys! All the enemy graphics are in the game, displayable, and linked to hitboxes, but they have zero logic beyond that. I only kinda started on the Hungry Ghost. I was scrolling through the frames, and where they were placed, they ended up like that. This is not a test of a Heruka running afterimage. It's just a result of trying to execute code that... isn't there yet. (Usually this means a crash.) I was adding an enemy, but didn't add its address to the list. Notice it missing my jump/axe input sometimes. I have no idea what the next update will be. Maybe all enemies programmed? SkullMan, KaboomKid, missingno and 1 other person like this. I don't know coding, but it looks like you already got the speed run animation already done. An educated guess of what was happening for the run was that Ajna was being rendered multiple times without the sprites being cleared. Each frame, a different set of graphics is switched in to display the active frame for Ajna. Parts of the after image look glitched because they are frames that require a different set of image data than the active frame. They're still drawn, just with the wrong data. This would eat up all available sprites, so that can't really be made into a feature. Actual update: All enemies are basically done. Oh, and also the game engine is done (more or less). So... what's left? There are a few things things that aren't enemies. (HUD, and some other stuff.) There are some non enemy, but still sprite graphics to do. (HUD... and... some other stuff.) There is background art. There is the music. There is polish. So the current plan is to finish all non background art/non enemy things. With this done, this will be a complete gameplay experience. From there I will send it to a small elite team to test. (Please, don't ask to get in on that.) While awaiting their feedback, I will work on (or... get someone to work on) the background art. Finally, I will attempt to make some music. I wrote a Lua script that runs through the emulator and lets me place enemies where the mouse is, as well as display hitboxes and other info. I didn't go full tilt, but how the enemies move is at least reasonably accurate to the game. erkicman, Goodbye18000, Broseidon Rex and 6 others like this. Hey, why I don't show the game looking really bad? So in this image, the game is trying to draw ~93 sprites sometimes. NES can only display 64 at a time, and then only 8 on the same horizontal line at the time. Ignoring the scanline thing, this means it has to drop about seven sprites per object on screen. And then... there's also the scanline thing. There will never be 3 Belus on screen in the real game, but yes... this game will have intense flicker. Now you know why most NES games don't bother with all this large animation. It looks a little better at 60 FPS, I promise. Fumako, KaboomKid, missingno and 2 others like this. You know if this was just a retro-styled fan game, that'd be a feature, not a problem. Tanner (Obeying the signature): You're not wrong! I haven't made a lot of time to work on this recently. Social things and whatnot. It's basically a half year old now, though. Yikes. All of this is spoilery, but anyone's who is following this probably gets the idea of what I'm aiming for anyway. I wanted to do that the easy way. Except that "environment" is too long a word to draw with sprites and avoid flicker. I'm mad because I actually went through it in my head so many times thinking I could do it with sprites. I was worried about "traverse", which is exactly eight letters... thought I was good because of that. Apparently never looked further. This was tough in ways I don't wanna get into right now. Although... part of it was me misreading documentation, so that's on me. (Obviously the timer won't display during real gameplay, that's a debug thing.) That timer was also work. So there's a thing the NES can do every frame consistently. Lots of games use it for music playback so that even if the gameplay slows down, the music playback won't. Seems like it'd be easy to rig a timer to. Except there's... a lot of reasons you might want to turn off that consistent thing, because it can WRECK things that aren't prepared for it to run. And disabling it anywhere meant the timer would not count those frames. I could not allow that to happen. What I did just to make the timer not stop while loading new areas... I'm terrified it's gonna lead to the game crashing in some cases. I've actually done a few things recently that I'm terrified will make the thing crash. Another thing that might make this crash? What I did to make sprites fade in. High stakes for such small things. The timer will still be "wrong", though. Because NES runs at not-quite-60FPS and the timer assumes 60FPS. I think even I'm not crazy enough to care about that, though. The fact is it's counting actual gameplay frames and (hopefully) isn't missing any. So even if the time doesn't match real time, you can still use it to compare records. Tetris Grand Master 2 has a similar quirk: The timer assumes 60FPS, but the hardware runs at not-quite-60FPS. Source. KaboomKid, missingno, SkullMan and 1 other person like this. I'm terrified it's gonna lead to the game crashing in some cases. I've actually done a few things recently that I'm terrified will make the thing crash. Another thing that might make this crash? What I did to make sprites fade in. High stakes for such small things. Gaming is built on such risks! Though seeing it like that makes me actually mad about Simon's Quest. Remember how IT faded out? If only they had 2016 knowledge of building NES games.